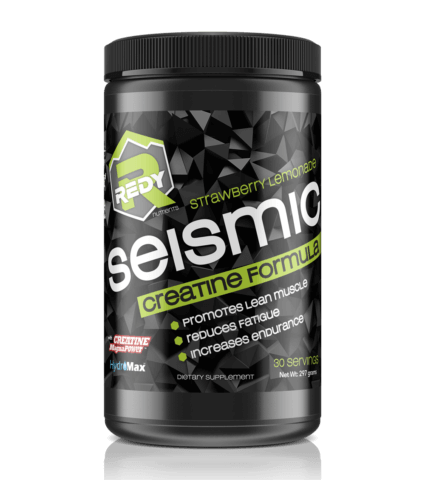 Seismic is an advanced blend of Creatine and Amino Acids designed to optimize muscle growth, strength and nutrient delivery to your muslces during intense physical activity. The primary ingredient in Seismic is Creatine Monohydrate which is a highly studied product, known for its ability to increase strength, muscle growth and power during physical activity. The unique combination of ingredients in Seismic are designed to optimize athletic performance. Creatine is one of the most studied of all performance enhancers over recent years. 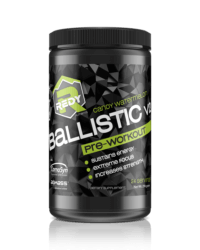 It has been found to have amazing ability to build tons of lean muscle mass and amplify the muscle energy of nearly anyone who uses it. Creatine is able to supplement these strength gains because it promotes the release of creatine phosphate. The muscles rely on this to produce ADP (adenosine diphosphate) which handles fueling ATP (adenosine triphosphate). ATP is responsible for fueling working muscles. 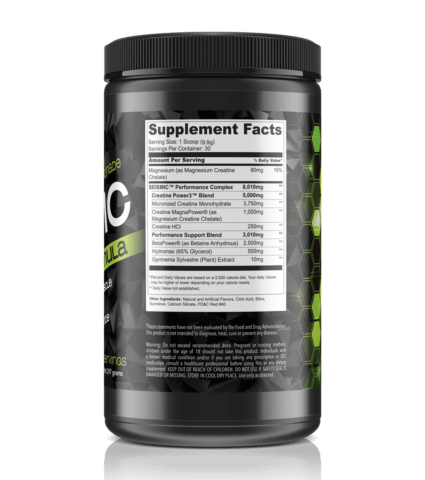 • Creates a higher level of absorption and utilization than creatine monohydrate. • Greater bioavailability of creatine and magnesium! • Ergogenic activity is enhanced when magnesium creatine chelate is consumed. • Greater increase in intracellular water, an indicator of greater protein synthesis. • Clinical studies showed it most strongly regenerated energy needed for anaerobic performance. 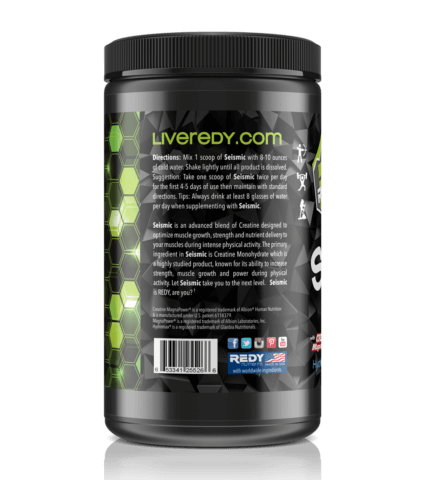 • Enhances the body’s ability to generate and regenerate ATP for SLAMMING muscle performance! 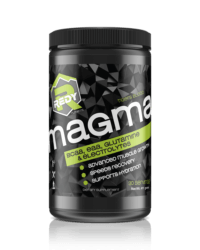 • Higher level of absorption than other combination regimens of magnesium and creatine. 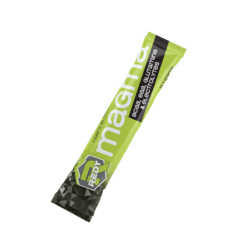 • Magnesium is an electrolyte and well known as a muscle nutrient! • Facilitates VITAL oxygen delivery to working muscle tissue. • Creatine MagnaPower® can be consumed with juice, water or other beverage of choice. BetaPower® Natural Betaine is a natural nutrient that promotes hydration and performance, especially related to physical activity. A form of high purity anhydrous betaine, BetaPower® Natural Betaine is minimum 99% pure and derived from the molasses of sugar beets. Also known as trimethylglycine or TMG, betaine is found in many healthful foods, such as whole grains, spinach and beets. HydroMax Glycerol helps to prevent dehydration during exercise, improve exercise performance and increase muscular pumps during resistance training. In particular, it increases the concentration of fluid in blood and intracellular tissues to a point of hyperhydration. 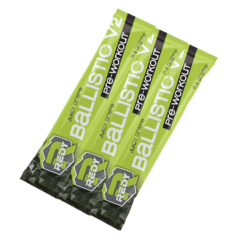 This helps prevent dehydration and improve performance and stamina in endurance events as well as promoting blood flow during resistance training. Gymnema sylvestre is an herb found in the tropical forests of India and Asia. Gymnema has historic use as a therapy for diabetes and arthritis and has also earned significant recent interest as a multi-supportive therapy for weight management. Evidence suggests gymnema can reduce cravings for sweets, sugar absorption during digestion, and promote normal blood sugar levels.